[S480] Copy birth certificate of Rowland Nixon, 21 May 1875 "unknown cd." [S49] UK National Census for 1881 Index, UK "RG11/3535/87." [S37] Website Cheshire BMD (http://cheshirebmd.org.uk/) "CON/45/11." [S72] UK National Census for 1891 for UK, "RG12/2846 f67 p16 87." [S344] Baptism, Christ Church (Biddulph Moor), 1863-1923 "p46/367." [S49] UK National Census for 1881 Index, UK "RG11/3535 f87 p25." [S512] Copy death certificate of Roland Nixon, 25 August 1958 "unknown cd." [S347] Burials, Christ Church (Biddulph Moor), 1863-1958 "p200/1594." [S345] Marriages, Christ Church (Biddulph Moor), 1864-1938. [S49] UK National Census for 1881 Index, UK "RG11/3535 f84 p20." [S191] Website Staffordshire BMD (http://staffordshirebmd.org.uk/) "5C/1/54." [S345] Marriages, Christ Church (Biddulph Moor), 1864-1938 "p27/54." [S191] Website Staffordshire BMD (http://staffordshirebmd.org.uk/) "5C/1/72." [S49] UK National Census for 1881 Index, UK "RG11 Piece 2740 Folio 60 Page 5." [S48] Online index to the UK National Census for 1901 for UK "RG13/2625 f68." [S541] MI, Roland and Selina Brown "unknown cd." [S49] UK National Census for 1881 Index, UK "RG11/2740 f60 p5." [S37] Website Cheshire BMD (http://cheshirebmd.org.uk/) "506/3/134." [S72] UK National Census for 1891 for UK, "RG12/2846 f66 p13 69." [S347] Burials, Christ Church (Biddulph Moor), 1863-1958 "p200/1598." Morton May Easington 10a 830." [S347] Burials, Christ Church (Biddulph Moor), 1863-1958 "p192/1534." [S48] Online index to the UK National Census for 1901 for UK "RG13/2621 f34 p1 9." [S37] Website Cheshire BMD (http://cheshirebmd.org.uk/) "CON/57/89." [S48] Online index to the UK National Census for 1901 for UK "RG13/2621 f34." [S72] UK National Census for 1891 for UK, "RG12/2846 f68a 18 102." [S704] UK National Census for 1901 for UK, "RG13/2621 f41a p16 96." [S37] Website Cheshire BMD (http://cheshirebmd.org.uk/) "CON/54/32." [S72] UK National Census for 1891 for UK, "RG12/2846 f69a p20 116." [S37] Website Cheshire BMD (http://cheshirebmd.org.uk/) "CON/55/3." [S45] Website FreeBMD (http://freebmd.rootsweb.com/) "Deaths Mar 1905 Brown Enoch 22 Leek 6b 243." [S37] Website Cheshire BMD (http://cheshirebmd.org.uk/) "CON/60/64." [S191] Website Staffordshire BMD (http://staffordshirebmd.org.uk/) "BRADBURY Lily Beatrice 61 1948 Biddulph Newcastle-Under-Lyme Staffordshire BI/4B/72." [S45] Website FreeBMD (http://freebmd.rootsweb.com/) "Marriages Dec 1890 Whitehurst John Herbert Congleton 8a 491. [S551] Baptism, St Lawrence (Biddulph), 1865-1876 "p57/355." [S356] Marriages, St Lawrence (Biddulph), 1881-1900 "p113/225." [S49] UK National Census for 1881 Index, UK "PRO Ref RG11 Piece 3535 Folio 78 Page 8." [S2183] E-mails from Cyril Mann to Alan Bennett, March 2008 Onwards "John Herbert Whitehurst daughter Caroline married Fred Harvey they had 2 children that I know of Lilly Harvey & Doris Harvey. Doris married Alfred Rock, they did not have any children. Caroline was b.22.Sept.1891 at Cross Street Biddulph d.1966. 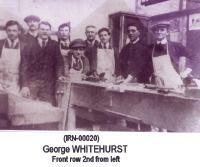 John Herbert Whitehurst b.06.July.1871 d.1953." [S37] Website Cheshire BMD (http://cheshirebmd.org.uk/) "4C/3/225." [S72] UK National Census for 1891 for UK, "RG12/2846 f114 p31 190." [S45] Website FreeBMD (http://freebmd.rootsweb.com/) "Marriages Jun 1898 Whitehurst John Herbert Leek 6b 513." [S45] Website FreeBMD (http://freebmd.rootsweb.com/) "Marriages Jun 1898 Sanders Mary Ellen Leek 6b 513." [S191] Website Staffordshire BMD (http://staffordshirebmd.org.uk/) "WHITEHURST John H SANDERS Mary E 1898 Smallthorne, St Saviour Stoke-On-Trent Staffordshire 28/2/068." [S70] General Record Office Indexes "Death Jun 1953 WHITEHURST John H 83 Stoke 9b 460." [S37] Website Cheshire BMD (http://cheshirebmd.org.uk/) "CON/41/65." [S72] UK National Census for 1891 for UK, "RG12/2846 f113 p29 174." [S191] Website Staffordshire BMD (http://staffordshirebmd.org.uk/) "4C/4/90." [S37] Website Cheshire BMD (http://cheshirebmd.org.uk/) "CON/45/19." [S191] Website Staffordshire BMD (http://staffordshirebmd.org.uk/) "4C/3/256." [S2183] E-mails from Cyril Mann to Alan Bennett, March 2008 Onwards "unknown cd." [S37] Website Cheshire BMD (http://cheshirebmd.org.uk/) "CON/49/32." [S704] UK National Census for 1901 for UK, "RG13/2621 f107 p33 187." [S191] Website Staffordshire BMD (http://staffordshirebmd.org.uk/) "1920 FOX Florence WHITEHURST Arthur Biddulph, St Lawrence Staffordshire Moorlands 4C/5/231." 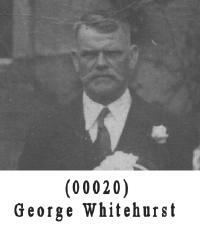 [S2183] E-mails from Cyril Mann to Alan Bennett, March 2008 Onwards "George Whitehurst married Sarah Elizabeth Ann Lea in 1902 at St.Lawrence Church, Biddulph, Staffordshire. Sarah Elizabeth Ann Lea b.1883 d.1953 at 22,Stringer Street, Biddulph, Interned at St.Lawrence Church, Biddulph." 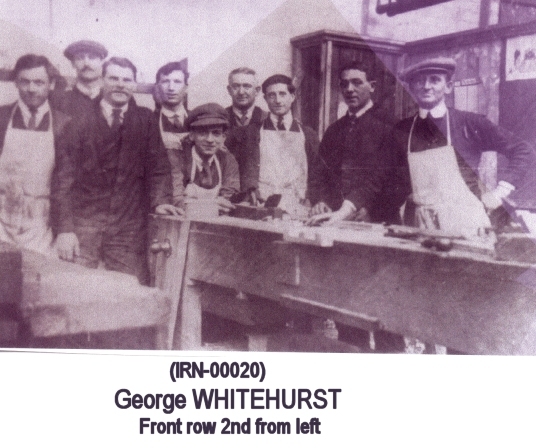 [S2183] E-mails from Cyril Mann to Alan Bennett, March 2008 Onwards "George Whitehurst b.26.June 1880 Robin Hill, Biddulph Moor, Biddulph, Staffordshire. d.1954 22, Stringer Street, Biddulph. Interned at Biddulph Church. George was a coal miner on 31 March 1901." Hannah Livinia Whitehurst b.24.March.1904 d.?? [S478] Copy birth certificate of Walter Brown, 1 February 1860 "unknown cd." [S45] Website FreeBMD (http://freebmd.rootsweb.com/) "Mar 1860 BROWN Walter Congleton 8a 273." [S37] Website Cheshire BMD (http://cheshirebmd.org.uk/) "CON/22/87." [S343] Baptism, St Lawrence (Biddulph), 1850-1864 "p69/550." [S2] UK National Census for 1871 for UK, "RG10/3702 f48a p16 83." [S37] Website Cheshire BMD (http://cheshirebmd.org.uk/) "BROWN Walter ROBINSON Ellen 1880 Warrington, St Paul Warrington Cheshire C27/9/328." # · On Sunday, February 08, 1880, he married Ellen Robinson. The ceremony was held at St. Paul's, Warrington. He was 20 years old. # · On Monday, December 06, 1880, John William was born. He was 20 years old. 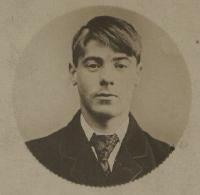 # · On Thursday, October 26, 1882, Arthur was born. He was 22 years old. # · On 1886, Mary was born. He was ~26 years old. # · On 1892, Hope was born. He was ~32 years old. # · On 1897, Annie was born. He was ~37 years old. # · On 1900, Charlotte was born. He was ~40 years old. # · Died on 1944. He was ~84 years old." [S601] UK National Census for 1881 for UK, "RG number: RG11 Piece: 3513 Folio: 32 Page: 29." [S72] UK National Census for 1891 for UK, "RG number: RG12 Piece: 3078 Folio: 74 Page: 6." [S704] UK National Census for 1901 for UK, "RG number: RG13 Piece: 3582 Folio: 54 Page: 23." [S2260] UK National Census for 1911 for UK, "RG14PN23159 RG78PN1353 RD459 SD4 ED29 SN290." [S49] UK National Census for 1881 Index, UK "RG11 Piece 3534 Folio 4 Page 4." [S191] Website Staffordshire BMD (http://staffordshirebmd.org.uk/) "4C/3/73." [S72] UK National Census for 1891 for UK, "RG12/2846 f62a p6 27." [S48] Online index to the UK National Census for 1901 for UK "RG13/2621 f40a p14 85." Register: Marriages 1880 - 1902, Page 10, Entry 19." [S2] UK National Census for 1871 for UK, "RG10/3910 f30 p53 259." [S262] Burials, St Thomas, Golborne, 13 Jan 1850-4 Sep 1869 "p15/113." [S68] Marriage, St Thomas, Golborne, unknown period "59." [S68] Marriage, St Thomas, Golborne, unknown period "62." [S312] Baptism, St Thomas, Golborne, 1849-1864 "250." [S68] Marriage, St Thomas, Golborne, unknown period "86." [S312] Baptism, St Thomas, Golborne, 1849-1864 "329." [S1088] Website Lancashire OPC (http://www.lan-opc.org.uk) "Baptism: 23 Sep 1866 St Thomas, Golborne, Lancs. [S1051] Website Lancashire BMD (http://lancashirebmd.org.uk/) "Wigan & Leigh : C8L/1/127." [S2199] Marriage, St Thomas, Golborne, 25 May 1912-21 May 1921 1849-1880 "p64/127." [S312] Baptism, St Thomas, Golborne, 1849-1864 "p67/529 Helen Livesley." [S601] UK National Census for 1881 for UK, "RG11/3801 f31a p56 291." [S2123] Copy marriage certificate of John Lowe and Alice Byrom, 25 May 1861 "unknown cd." [S262] Burials, St Thomas, Golborne, 13 Jan 1850-4 Sep 1869 "p53/420." [S69] Unknown editor ed. St Thomas (Golborne) MI "p11/15a." [S262] Burials, St Thomas, Golborne, 13 Jan 1850-4 Sep 1869 "p82/650 Hannah Widdows, Golborne, 15 March 1867, 46, CT Quirk." [S1051] Website Lancashire BMD (http://lancashirebmd.org.uk/) "MORT Alice CLARKE John 1868 Golborne St. Thomas Wigan & Leigh Lancashire C8L/1/304." [S261] Baptism, St Thomas, Golborne, 1864-1903 "p65/519." [S321] Burials, St Thomas, Golborne, 22 Sep 1869-21 Nov 1903. [S69] Unknown editor ed. St Thomas (Golborne) MI "p35/38a." [S321] Burials, St Thomas, Golborne, 22 Sep 1869-21 Nov 1903 "p37/294 Ellen Waterworth, Golborne, Feb 1 1874, 36 Years, CT Quirk." [S321] Burials, St Thomas, Golborne, 22 Sep 1869-21 Nov 1903 "p42/331." [S261] Baptism, St Thomas, Golborne, 1864-1903 "p129/1027." [S321] Burials, St Thomas, Golborne, 22 Sep 1869-21 Nov 1903 "p77/615." [S261] Baptism, St Thomas, Golborne, 1864-1903 "p157/1251." [S1088] Website Lancashire OPC (http://www.lan-opc.org.uk) "Baptism: 7 Dec 1879 St Thomas, Golborne, Lancs. [S49] UK National Census for 1881 Index, UK "RG11 Piece 3801 Folio 11 Page 16." [S1088] Website Lancashire OPC (http://www.lan-opc.org.uk) "Baptism: 5 Feb 1882 St Thomas, Golborne, Lancs. [S261] Baptism, St Thomas, Golborne, 1864-1903 "p188/1499." [S261] Baptism, St Thomas, Golborne, 1864-1903 "p193/1540 24 Sep 1882 James Son of John & Alice Jenkin, Golborne, Farmer, CT Quirk Born 18 August 1882." [S72] UK National Census for 1891 for UK, "RG12/3083 f14 p33 199." [S2127] Original marriage certificate of Thomas Lowe and Ellen Bradburn, 25 December 1882 "unknown cd." [S321] Burials, St Thomas, Golborne, 22 Sep 1869-21 Nov 1903 "p131/1045 Martha Lowe, Golborne, 1 February 1883, 67, Rev C T Quirk." Parish as it Appears: Golborne." [S321] Burials, St Thomas, Golborne, 22 Sep 1869-21 Nov 1903 "p148/1180 William Reeves, Golborne, 5 August 1884 64 CT Quirk." [S653] J Taylor - Clerk St Thomas, Bill for Burial, 5 August 1884 "unknown cd." [S321] Burials, St Thomas, Golborne, 22 Sep 1869-21 Nov 1903 "p157/1252 Charles Thomas Quirk, Rectory, Golborne, 3 June 1885, 73, John Whitley Rector of Newton in Makerfield." [S72] UK National Census for 1891 for UK, "Class: RG12; Piece: 3083; Folio: 79; Page: 4; GSU roll: 6098193." [S48] Online index to the UK National Census for 1901 for UK "RG13/3587 f84." Register: Marriages 1880 - 1902, Page 158, Entry 315." [S45] Website FreeBMD (http://freebmd.rootsweb.com/) "Marriages Dec 1895 Ogden Fred Leigh 8c 336. [S261] Baptism, St Thomas, Golborne, 1864-1903 "p378/3021." [S261] Baptism, St Thomas, Golborne, 1864-1903 "p391/3128." [S322] Baptism, St Thomas, Golborne, 1903-1915. [S69] Unknown editor ed. St Thomas (Golborne) MI "9E." [S261] Baptism, St Thomas, Golborne, 1864-1903 "3128." [S45] Website FreeBMD (http://freebmd.rootsweb.com/) "Births Mar 1901 Ogden Ellen Leigh 8c 280." [S45] Website FreeBMD (http://freebmd.rootsweb.com/) "Births Dec 1902 Ogden Caroline Leigh 8c 290." [S76] UK National Census for 1841 for UK, "HO107/524/7 ED2 f34 p16." [S880] Website Ancestry (www.ancestry.co.uk) "Ancestry.com. Lancashire, England, Church of England Deaths and Burials, 1813-1986 [database on-line]. Provo, UT, USA: Ancestry.com Operations, Inc., 2012." Source: FHL Film 1656144 Dates: 1803 - 1819. [S626] Marriages Transcript, St Oswald (Winwick), 1813-1841 "8 Oct 1815 Thomas x Bate & Elizabeth x Lymer Wit Thomas Walker (Parish Clerk) & John Lowe." [S45] Website FreeBMD (http://freebmd.rootsweb.com/) "Deaths Sep 1847 Bate Thomas Leigh 21 355." [S68] Marriage, St Thomas, Golborne, unknown period "27." [S68] Marriage, St Thomas, Golborne, unknown period "13." [S68] Marriage, St Thomas, Golborne, unknown period "32." [S40] UK National Census for 1851 for UK, "HO107/2204 f54a p19 64."